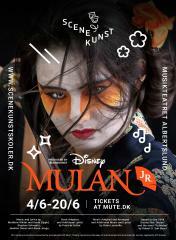 SceneKunst is proud to present Disney's Mulan Jr., with International students between the ages 4 - 18 years old. The Musical is based on the cartoon MULAN and is filled with music, singing and dancing. The Fa Family Ancestors narrates the story of the girl Mulan, who dresses as a boy to take her fathers place in the Chinese army, even though it is punishable by death, and her family's honor is at stake. With the help of Mushu, the tiny dragon, she saves the army from the Huns by starting an avalanche. The leader, Shang, is celebrating, but discovers that Mulan is a girl. He saves her life, but abandons her in the mountains. Suddenly the Huns have dug out from under the avalanche, and they run off to attack the Emperal City. Mulan runs after them to warn the army, but they don't believe her anymore. The Emperor is kidnapped and the city taken. Mulan persuades Shang and the soldiers to dress up as women to fool the Huns, so they can enter the Emperors chambers, while Mushu warns the army. The Soldiers save the Emperor, and the Huns withdraw. Mulan returns home with the Emperors honor. Shang surprises Mulan, when he arrives to ask for her hand. Mushu receives the honor of a place amongst the Ancestors.